Can I transfer my Spotify music to my iTunes library? – As one of the most popular streaming music service, Spotify allows music lovers to assess to over 30 millions songs for online listening and provides the option to download thousands of playlists for Spotify premium subscriber. Although Spotify has the ability to import your local songs and playlists, there is no direct way for Spotify users to transfer music from Spotify to your iTunes library. However, there are always some situations for Spotify users to import Spotify songs to iTunes library, such as burning Spotify playlists to CD via iTunes app or switching Spotify subscription to Apple Music subscription. Thus, is there a way to transfer music from Spotify to iTunes library? The answer is positive. Here we'll show you the effective solution on how to export any song and playlist from Spotify to iTunes library. If you are one of the Spotify users, you might be familiar with the rules of Spotify. As a Spotify lover with a free account, you are not able to download Spotify songs, playlists and albums for offline playback. Only in the case that you have subscribed for Spotify premium, you can get the rights to download Spotify music for offline listening on selected media players and devices, but iTunes is not included in the list of supported media players. The key reason leads to this situation is that Spotify music files are encrypted by DRM copyright technology, which limits users' rights to utilize Spotify playlists, songs and albums. That's to say, Spotify users don't truly own Spotify music. So you can't export downloaded music from Spotify into iTunes library, USB flash drive, MP3 player, or any other device. From what we mentioned above, we all know that Spotify songs are protected by DRM technology that restricts us to transfer songs from Spotify library to iTunes. In fact, apart from the restriction of DRM protection, Spotify tracks are encoded in OGG Vorbis format that can't be added to iTunes library. 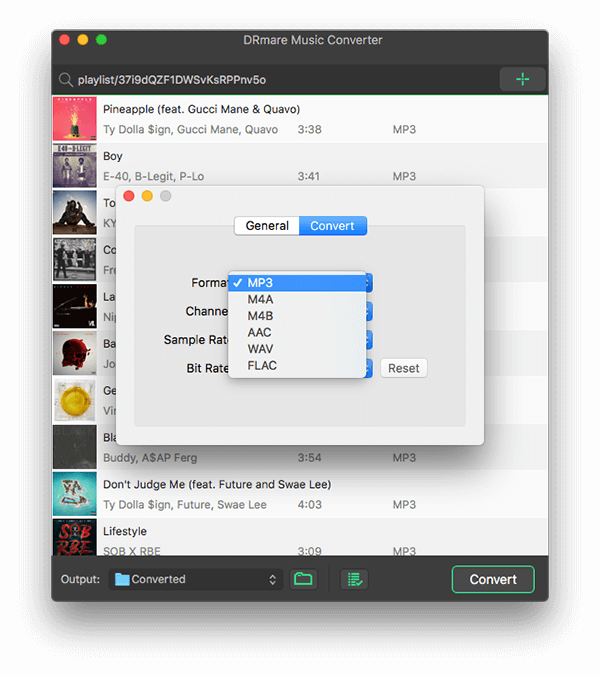 In order to transfer Spotify songs to your iTunes library, you should turn up to the third-party Spotify converter which can remove DRM from Spotify music and convert Spotify songs to iTunes compatible formats, like MP3 or M4A. And then you can freely sync Spotify library to iTunes. 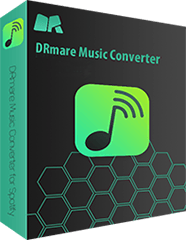 When it comes to the best Spotify Music Converter to switch Spotify songs to iTunes library, we highly recommend DRmare Spotify Music Converter, a one-stop excellent streaming music downloader and converter for Spotify. It is specialized in downloading any content from Spotify catalogue and bypassing DRM from Spotify songs, playlists and albums even if you are not a premium subscriber. 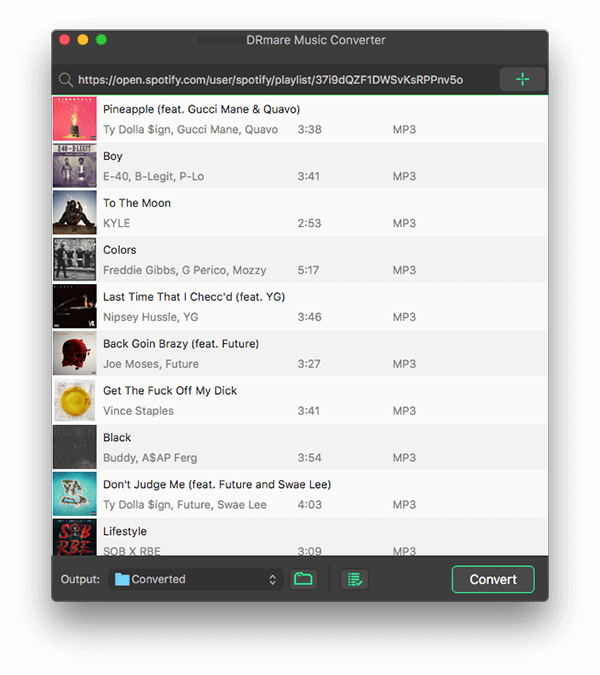 Thanks to this smart Spotify converting tool, you can also use it to extract Spotify tracks to iTunes supported MP3 format and other common audio formats, like AAC, M4A, FLAC, M4B, etc. Remove DRM from Spotify music to MP3, AAC, M4A and other formats. Now, you can download and install this professional Spotify DRM removal tool on your computer to transfer Spotify music to iTunes. DRmare Studio offers the free trial version to test its performance before purchasing. The following is the detailed tutorial to convert Spotify songs to MP3 files while breaking the DRM lock with the help of DRmare Music Converter for Spotify. Double click to open DRmare Spotify Music Converter, and Spotify app will be launched automatically. Once you login in Spotify with your personal account, you can drag and drop songs, playlists and albums from Spotify to the conversion window of DRmare directly. Or you can copy and paste the URL link of Spotify tracks to the search box in the main interface and click "+" button to add music to this smart tool. The output format of DRmare Music Converter for Spotify is MP3 by default. So you can just skip this step and keep it by default. If you would like to set output format as other iTunes compatible formats, like M4A, please click the menu bar -> 'Preference' to open a new window, in which you can see a list of supported output format and choose favorite audio format by click the target audio format icon. 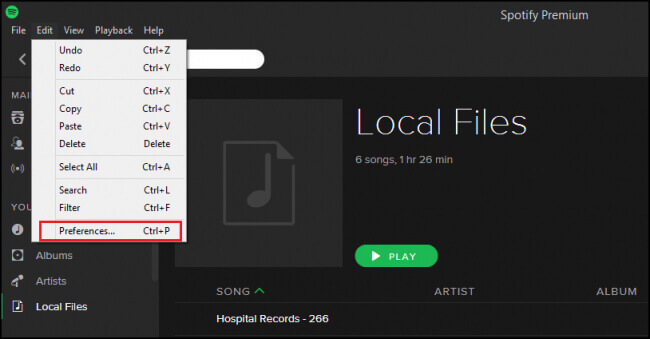 In this step, you can also click the option of "Archive output tracks by" to let Music Converter for Spotify to classify your output tracks by artist or album automatically. Once all settings are ready, you can click the Convert tab to launch the conversion process to convert Spotify songs to MP3 or other iTunes supported formats while removing DRM protection from imported Spotify music. Besides, in order to make the converting process more smoothly, you’d better set the conversion speed as 1X. When the conversion process finishes, you can locate the unprotected Spotify music files on the destination folder. Now, it's time for you to move downloaded Spotify library to iTunes. 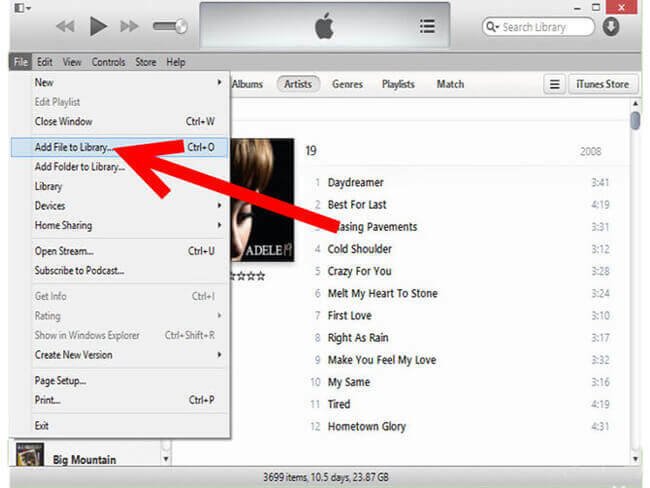 You can choose the more suitable way to add Spotify songs, playlists and albums to iTunes library. Method 1: The most intuitive way is to drag and drop files or the folder included converted DRM-free Spotify songs to iTunes music library. Once imported successfully, you can listen to Spotify music in iTunes library freely. Method 2: Launch iTunes app and click the menu bar -> Files -> Add to library in the upper-right corner of the main screen. You can browser the files on your computer to find out the downloaded Spotify songs and folder and touch Open button. Now, Spotify unprotected music files will be added into your iTunes library automatically. When it comes to transferring iTunes library, please keep in mind that Apple Music are protected by FairPlay DRM technology. 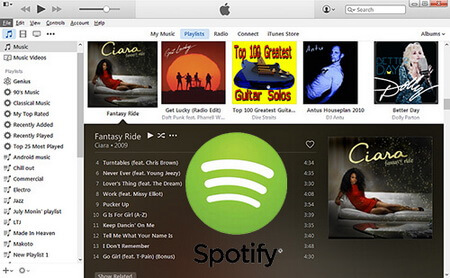 There is not an official way to move Apple Music to Spotify to avoid unauthorized sharing. Put it another, you are not allowed to import Apple Music from iTunes library to Spotify directly. But don't worry. You can use Apple Music Converter. It can help you remove DRM from Apple Music and convert Apple Music DRM M4P to Spotify compatible formats, like MP3. 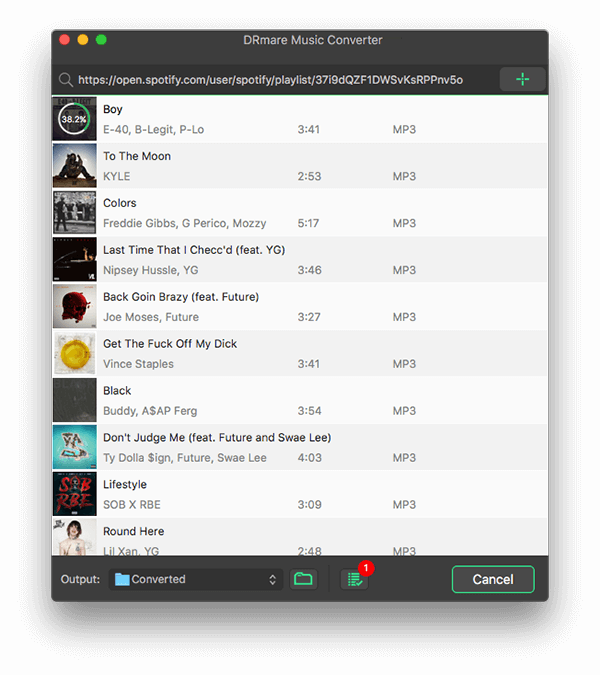 You can convert DRM-protected Apple Music M4P to Spofity supported local files. Just follow the instruction: follow the detailed source page: How to Convert Apple Music to MP3. After that, you can follow the simple tutorial to transfer Apple Music from iTunes to Spotify. Also, you can refer to this guide to transfer compatible iTunes music files to Spotify directly. 1. Please open the Spotify website page, enter to 'Edit' -> 'Preferences' and then scroll down until you see the 'Local Files' box. 2. There are lots of options for your choice. You can check the mark next to iTunes. Please make sure unprotected Apple Music songs saved in iTunes. Or you need to click 'Add Source' to locate the Apple Music files or the target folder. 3. Once iTunes library syncs to 'Local Files' in Spotify, you can copy/paste all DRM-free Apple Music files and drag them to Spotify's Songs.